HTC Wildfire is a mobile phone, released in the year 2010, offering pretty good set of features. As at September 2010, the price is 558 BGN without any contract, or 12 lease payments of 39 BGN and contract with the M-Tel mobile operator. The device, being quite affordable, is a decent purchase for the young people who are addicted to the Facebook. The capabilities it offers, makes it a good purchase for anyone, who wants to have nice looking phone, bundled with functionality. Friend Stream - Your many friends, across multiple social networks, all in one place. Personally Recommended Apps - Found a cool new game or application on Android Market? Pass it on! People Widget with Groups - Easily keep in tune with different circles of friends. HTC Caller ID - See your caller's name, latest Facebook photo, status, and birthday reminder... before you say hello! Polite Ringer - some phones ring and ring and ring! 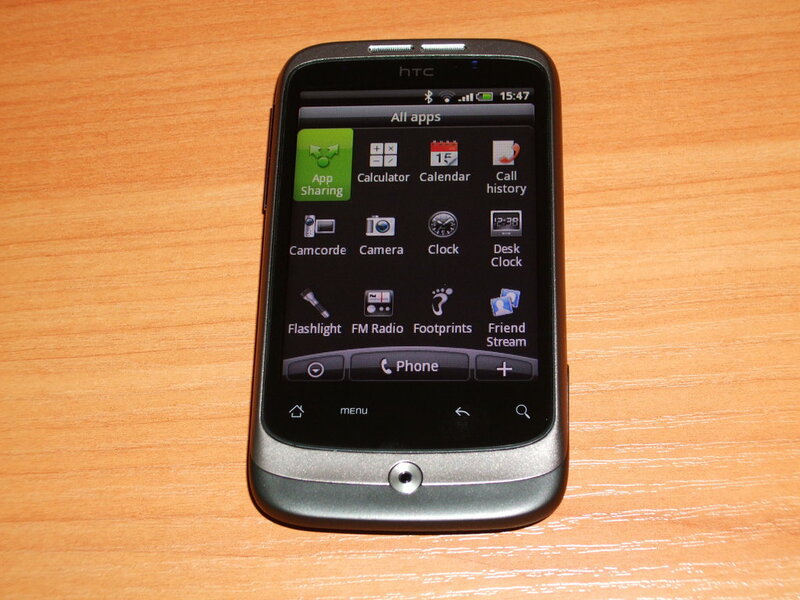 With HTC Wildfire, the ringer volume drops as soon as you pick it up. The specifications of the phone are listed as well: Model - A3333, CPU Speed - 528 MHz, Platform - Android 2.1 (Eclair) with HTC Sense, Memory - 512 MB ROM and 384 MB RAM, Size and weight - 106.75 x 60.4 x 12.19 mm, 118 grams, Display - 3.2-inch touch-sensitive screen, GPS - Internal GPS antenna, Network - HSDPA/WCDMA (900/2100 MHz), GSM/GPRS/EDGE (850/900/1800/1900 MHz), Connectivity - Bluetooth 2.1, A2DP, FTP, OPP, and PBAP, Wi-Fi: IEEE 802.11 b/g, 3.5 mm stereo audio jack, Standard micro-USB, Camera - 5 megapixel color camera with auto focus and flash, Expansion Slot - microSD card. Looking at all these highlights would make one to instantly buy the phone. Quite impressive set for the price of the package. Inside the box are the HTC Wildfire phone, placed in separate paper bed, USB cable, headphones with clip, power adapter and several small books with the manual, warranty card, warranty statement and contact book. The power adaper is quite unique, without any cable, having just an USB port at the top. There is no pouch in the package, but on small black and white leaflet with the accessories, standard pouches are shown, along with international travel charger pack, remote control, bluetooth headset and car charger. For me the pouch is only missing from the accessories, as it shall be included, like it is in the Nokia E72 package. The phone is not ready for use straight out of the box. To use it for first time, before trying to charge it, the user have to remove the battery protector, which requires open of the back cover. To open the back cover, stick a fingernail in the small crack at the up side on the back, then slowly and carefully open the rest. It is not as easy as it shall be, the headset jack making it even harder, but once it is done, the user can place a SIM card as well. The battery is big, with dimensions of 6.5 x 4.5 cm, covering almost the whole back, but thin (only 5 mm). When the USB cable is connected to the charger and the phone and everything is okay, a red light led will indicate the correct status of the charging process. For first time, the recommended charge of the battery is three hours. Of course the adaptor is not obligatory for the battery charge. The USB cable inserted in a computer will work as well. Just like in the Toshibo V9+i. Once the battery is fully charged, the led on the upper-left part of the phone will change to green, giving green light to the user. Press the power button on the up for three seconds and white screen with the HTC logo will appear, along with short vibration. Once the operating system loads, prepares the SD card and configures its initial settings, the phone is ready to use. I never used a phone with such interface, but I got used to it very fast. There are two ways to control the menus - with the optical trackpad and by the multitouch screen. I found the screen much easier, although not that exact controlling interface, and easily forgot about the optical pad, where I had to press the button for every selection, not just by levering finger down. The extra effort for pressing the keys made screen finger-touches the default input method for me. Touching the screen with hand leaves lots of fingerprints, but they are easy to clean with ordinary clothe. I tried to use stylus pen for more precise keyboard entries, but it did not work. Only the fingers (less exact) worked. There are four menus icons down under the screen, for Home, Menu, Back and Search, but they are used less often. The default screen saver option of the phone is set to one minute. After one minute of unuse, when the screen goes black, the user have to press the power button in order to be able to use the interface again. Included in the phone, written nowhere else, is 2 GB miniSD card, having 1.83 GB total space and 1.72 GB available. There are approximately 110 MB of phone files, HTCDriver_2.0.7.17 and manuals. Deep look at the files reveals their date as 06-July-2010, the manual being the newest as at 13-July-2010. These dates suggest when the files of the firmware were build and the phone released to the public. Connecting the phone to the Amiga announces it as a HTC Android phone . After selecting to use the phone as a disk drive, I had no problems accessing the files located on the miniSD card. The SD card can be unmounted for safe removal, but unlike on the Nokia E51, where the cover is opened with easy push of a button, to physically remove the memory card, the back cover must be opened, with the uneasy procedure. Pressing the icon on the bottom-left on the main screen, brings the application menu, consisting of 3X4 icons grid. The most important application for me in the phone is the Internet browser, accessible by clicking on the Internet icon. 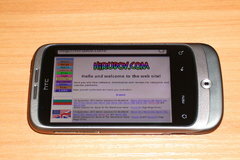 Installed in the phone is Mozilla/5.0 (Linux; U; Android 2.1-update1; en-gb; HTC_Wildfire_A3333 Build/ERE27) AppleWebKit/530.17 (KHTML, like Gecko) Version/4.0 Mobile Safari/530.17 . The browser is very fast and compatible. I had no problem visiting sites with different content, English and Bulgarian. 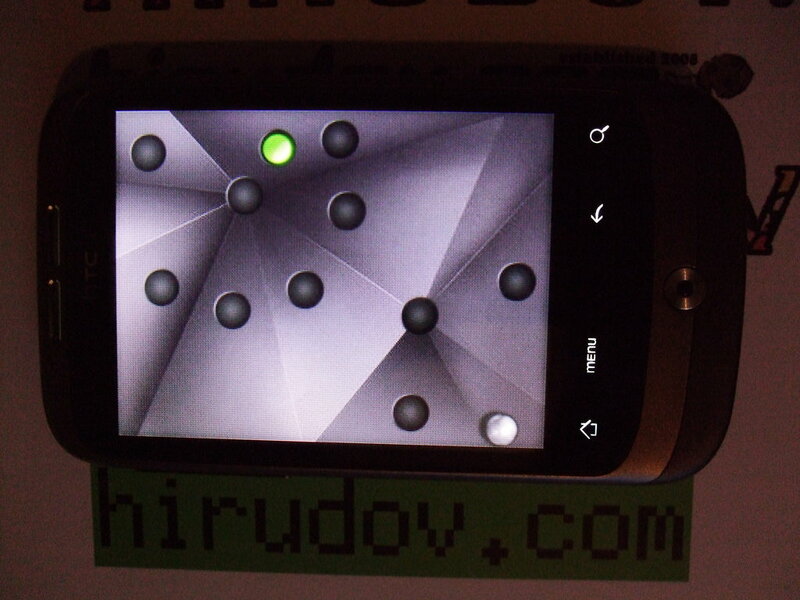 Even the videos on hirudov.com website were playable, unlike on the Nokia E72, where I did not had success with the Flash content. With the autorotation, surfing the Internet and reading the content is almost as easy on desktop computer. Other applications are the Calculator, Calendar, Footprints, Friend Stream, Gallery, Google Mail, gOut, Mail, Maps, Market, Messages, PDF Viewer, Peep (Twitter client), People, Quickoffice, SIM Toolkit, Stocks, Talks, Voice Recorder and YouTube. Many of these applications require working Internet connection (through Wi-Fi or the mobile network) and working Google Account (Free to create). The Maps application using the Google Maps data was able to locate me very near to where I actually was, using only the Wi-Fi networks and no GPS satellites. The shown landscape was quite recent picture of the place around as well, shot from airplane, after selecting additional layers from the menu. There is Quickoffice application on the main menu, but when selecting it, error message appears - No files were found on your SD card. , without the option to create new files for office usage. Google Docs can do the job as well. The Stocks application, being different uses data from Yahoo Finance, unlike the other Google oriented software. The camera flash can be used as a flashlight in the dark. The phone have special application for this function, with animation of flashlight on the screen. Just like the Nokia 1208, where the flashlight have a special menu item. There is possibility of detailed overview of what has been using the battery in the settings menu. It shows the applications that use it, which can help for better management of the battery consumption. For example, I saw that the Bluetooth was using 2% of the battery, just because it was turned on, so I switched it off, when I did not use it. Along with the applications bundled with the phone, there are eight demo MP3 songs with cover arts from the albums: Marisa Cristina - Forget Me Now , Samantha James - Rise , Kaskade - Steppin' Out (Kaskade Chill Out Mix) , Various Artists - Underground Communication - Stomp [feat. Seasunz] , Bethurum - Dossier - Synesthesia , Colette - Push - Think You Want It , Andy Caldwell - Universal Truth - Warrior , People Under The Stairs - The Om Years - Youth Explosion . Good mix of songs, that will match quite different tastes. There are thirteen photos in the Gallery, but they are not shot with the HTC Wildfire, judging by their file headers. The weather application and widget can be very handy for bicyclists like me, and I quite liked the demo animations of different weather conditions. The phone have 5.0 megapixel camera on the back. In my tests, I was able to do some very decent pictures. There is zooming, and like on the other phones, it is not done by movement of the lenses, but digitally. The flash situated next to the camera helps a lot for close objects. The flash can be forced, set to auto or disabled. Real-time effects can be applied to the shot images - Greyscale, Sepia, Negative, Solarize, Posterize and Aqua, but there is no image processing application bundled with the phone. The camera can shot videos as well, in resolutions - CIF (352 x 288), QVGA (320 x 240) and QCIF (176 x 144). The supported encoding types are MPEG4 and H.263. The recorded encoded video is with .3gp extension, playable on AmigaOS 4 with MPlayer, without sound. The photos can be Geo-tagged, by the built-in GPS - disabled by default probably for privacy reasons. Everything shot can be very easily shared on the social networks with several fast clicks on the icons. Included in the phone is the game Teeter, where the player must guide a ball through corridors with black holes, to the special, green hole. The levels are consisting of single platform located on the one screen, without any scroll. The navigation of the ball is done by turning the phone left, down, up and right. After the seventeenth level, the surface is not just flat, but there are some curves, making it harder to guide the ball to the correct hole. Even if looking pretty simple, the game is quite a challenge, requiring not only fast reflexes, but good memory of the movements as well. The ball can bounce and go straight to the black holes, so being fast is not always the best strategy. The physics are very well programmed. When the ball is moving too fast and hits an obstacle, the phone vibrates, giving the feel of the ball to the player's hand. The only game in the phone is very good selection, showing the capabilities of non standard control of the playing objects, with the use of gravity sensor. On some levels, shortcuts are possible with fast moving balls, but they are most unlikely to happen, making the normal route the preferred way. I was able to complete the thirty-two levels in less than a hour, but the game is big challenge nevertheless. There are unlimited number of balls and the reached level can be resumed later. Once completed, the player can have fun with the game again, by trying to complete it with one hand, left hand, right hand, two hands, foot, shoulder or different other combinations. Even if only one game is bundled with the phone, there are many other games, emulators and fun applications available on the Android.com Market - free and paid, with wide selection of genres, coming from many developers. I am quite impressed by the phone and what it offers for the price. When buying a new phone, the HTC Wildfire is serious option to be considered, especially with the long battery charge, the G-Sensor, the easy management, the good navigation and the light weight. It is an impressive piece of technology, real fun to use. The Android operating system is not yet that popular as the Symbian, but it is slowly gaining its bigger share, bundled with nice products as the HTC Wildfire phone.